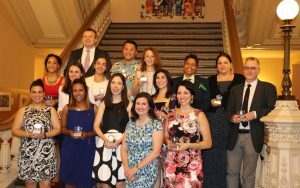 Congratulations to the 19 recipients of the fifth annual Big Apple Awards, announced in May 2017 by New York City Department of Education Chancellor Carmen Fariña. These honorees represent New York City public school teachers, who as Mayor Bill de Blasio put it, “Go the extra mile to help their students, engage parents, and support their colleagues.” In order to receive the Big Apple Award, applicants were rigorously evaluated through community nominations, principal and colleague recommendations, personal essays, an interview, and classroom observation. During the next school year, these honorees will serve as Big Apple Fellows, meeting monthly with each other to strengthen their leadership skills and serving on the Chancellor’s Teacher Advisory Group. CUNY is honored to have played a role in 13 of the recipients’ journeys towards becoming teachers. We would also like to recognize two of these CUNY graduates who are teaching math—Yocasty Diaz and Faye Michalakos! Ms. Diaz serves as a middle school math teacher at I.S. 219 New Venture School in the Bronx, describing her classroom as “a center of investigation, discovery, and risk-taking opportunities.” She attended both Hostos and City College. Michalakos, a CSI alum, is a middle school math teacher in Brooklyn who uses real world examples and experiences for her students, helping them understand the “why” behind the subject. CUNY is proud of these individuals for being leaders in the classroom and for fostering a commitment to mathematics for students at an early age. thanks your article, very useful! thanks your article that i read always makes me gots some idea.and new think.